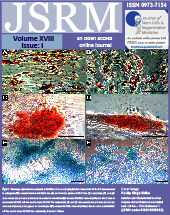 German Stem Cell Society to Support the JSRM. Decision taken in the General Body of GSS on the 3rd Nov 2006, Cologne, Germany. Powerful research and list-building tools provide enterprise-wide value. Copyright Policy: The entire contents of JSRM are FREE to be copied and used for any non-commercial purpose, provided JSRM is acknowledged. JSRM is conducting a Comprehensive Workshop on Research & Scientific Publishing. From 08:30 ~ 18:30 Hrs. Who all can participate: Students, Post-doctoral fellows and faculty in Medicine, Life Sciences & Biotech. How to participate: Please download the application form, fill it and send to us with the registration fee and your brief profile. Students need to get a certificate from their head of the institute if they apply under student category. Late & Spot registration: 1st December 2006 till date of the event (Provided seats are available). * As we intend to have a very limited crowd enable group discussion and free interaction among the attendees, once the maximum permissible no. of registrants complete their registration formalities, early closure of the registration is likely. Published by: M/S. G N Corporation Co. Ltd.